Cloonan suffered an upper body injury and is listed as “day-to-day.” Junior assistant captain Nikolas Olsson, who missed the Northeastern series with an injury, has been cleared to play and, according to Quinn, should be available to play Friday. The injuries will necessitate some changes to BU’s second line. Quinn plans to move Jordan Greenway to center and have Nick Roberto move up to that line’s right wing. ►Episode 6 of Inside BU Hockey features Bernie Corbett’s interviews with Quinn, freshman wing Kieffer Bellows and writer Neal Boudette. Bellows, son of retired NHL star and Stanley Cup winner (with Montreal) Brian Bellows, scored his third goal of the season in Saturday’s 3-0 win against Northeastern. A first-round draft pick of the New York Islanders, the Edina, Minnesota native rang up 50 goals last season for the USNTDP U18s, a feat exceeded only by Auston Matthews, Phil Kessel and Patrick Kane. The previous season he scored 33 goals for Sioux Falls (a single-season USHL record for a 16 year old), led the Stampede to the Clark Cup title and earned Rookie of the Year honors. Boudette (BU '84), who covers the automotive sector for the New York Times and writes about hockey any chance he gets, is a guest contributor The Terrier Hockey Fan Blog. His feature article on David Quinn and the Terriers appeared in the Times on Oct. 13. ►The weekend games against Michigan will both be available as free live streams on MGOBlueTV. Friday’s game begins at 7:30, while Saturday’s puck drop is set for 5 p.m. A half-hour pre-game show precedes each game. On Friday, BU is sponsoring a pregame gathering in Ann Arbor at The Brown Jug at 1204 South University in Ann Arbor, beginning at 5:30. Also on Friday, there will be a BU Hockey Watch Party at T’s Pub, 925 Commonwealth Ave., Boston. The early signing period has begun and several members of BU’s 2017 recruit class have signed their National Letters of Intent. Among them: Bowers, Kotkansalo, Hank Crone and three from the NTDP U18s, David Farrance, Brady Tkachuk and Logan Cockerill. Assistant coach Scott Young has been named to the St. Louis Blues roster for the 2017 Winter Classic Alumni Game against the Black Hawks on December 31. Former Terrier Ahti Oksanen scored his first professional goal in the ECHL Greenville Swamp Rabbits' 3-2 overtime loss to Orlando. 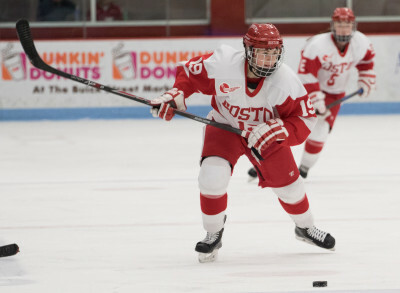 Oksanen is joined on the Greenville roster by former BU captain Garrett Noonan.